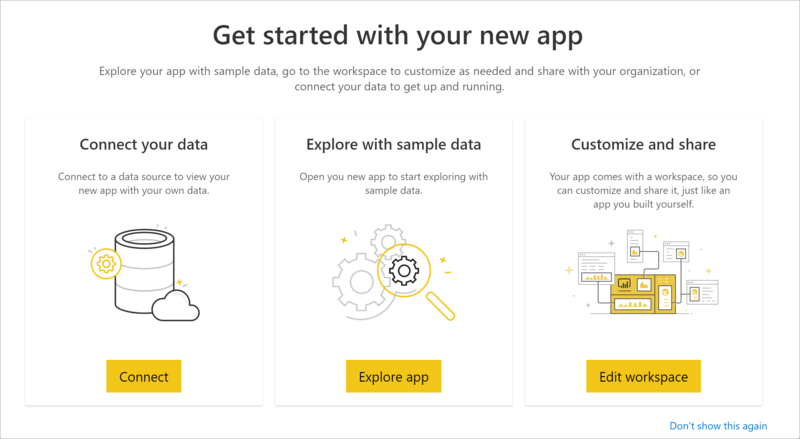 The new Power BI template apps enable Power BI partners to build Power BI apps with little or no coding, and deploy them to any Power BI customer. This article contains step-by-step instructions to create a Power BI template app. If you can create Power BI reports and dashboards, you can become a template app builder and builds and packages analytical content into an app. You may deploy your app to other Power BI tenants through any available platform, such as AppSource, or by using it in your own web service. As a builder you have the possibility to create a protected analytics package for distribution. Power BI tenant admins govern and control who in their organization can create template apps, and who can install them. Those users who are authorized can install your template app, then modify it and distribute it to the Power BI consumers in their organization. Permissions to create a template app. See the Power BI admin portal, Template app settings for details. 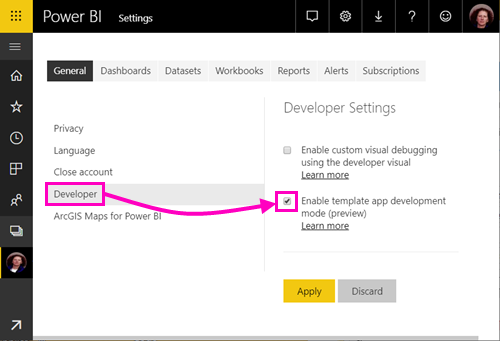 To create a template app you can distribute to other Power BI tenants, you need to be in App Developer mode. Otherwise, you're just creating an app for Power BI consumers in your own organization. Open the Power BI service in a browser. Go to Settings > General > Developer > Enable template app development mode. If you don't see that option, contact your Power BI admin to grant you permissions for template app development in the admin portal. 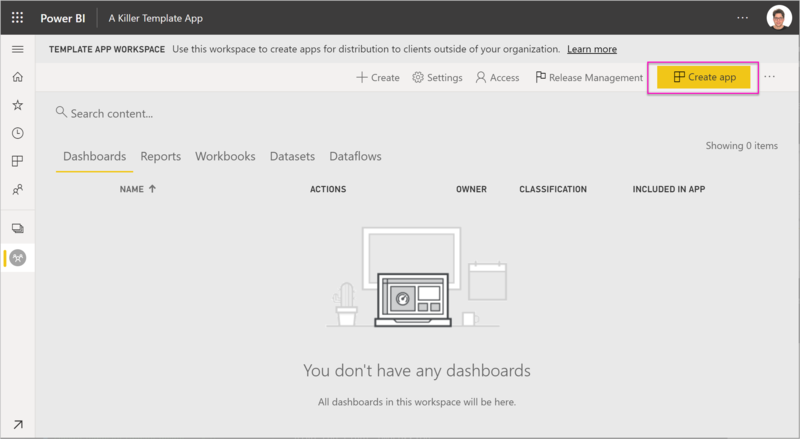 To create a template app you can distribute to other Power BI tenants, you need to create it in one of the new app workspaces. 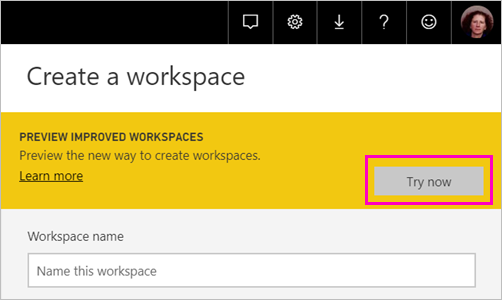 In the Power BI service, select Workspaces > Create app workspace. 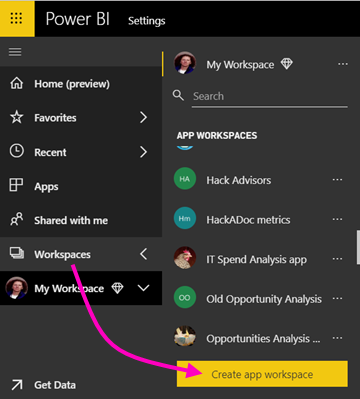 In Create an app workspace, in Preview improved workspaces, select Try now. Enter a name, description (optional), and logo image (optional) for your app workspace. Select Develop a template app. As with a regular Power BI app workspace, your next step is to create the contents in the workspace. In this preview version of template apps, we support only up to one of each type: one dataset, one report, and one dashboard. Create your Power BI content in your app workspace. If you're using parameters in Power Query, make sure they have well-defined type (for example, Text). The types Any and Binary aren't supported. Tips for authoring template apps in Power BI (preview) has suggestions to consider when creating reports and dashboards for your template app. Now that you have content in your workspace, you're ready to package it in a template app. The first step is to create a test template app, accessible only from within your organization on your tenant. In the template app workspace, select Create app. Here, you fill in additional parameters for your template app, in four categories. App landing page (optional): Define a report or dashboard to be the landing page of your app. Control several limitations and restrictions that your application users will have with the content of your application. You can use this control to protect certain intellectual property your app might contain. In the test phase, decide which others in your organization can install and test your app. Don't worry, you can always come back and change these settings later. You see a message that the test app is ready, with a link to copy and share with your app testers. You've also done the first step of the release management process, which follows. Generate test app: for testing only in your organization. Promote the test package to pre-production stage: test outside of your organization. Promote pre-production package to Production: production version. Delete any package or start over from previous stage. The URL doesn't change as you move between release stages. Promotion doesn't affect the URL itself. 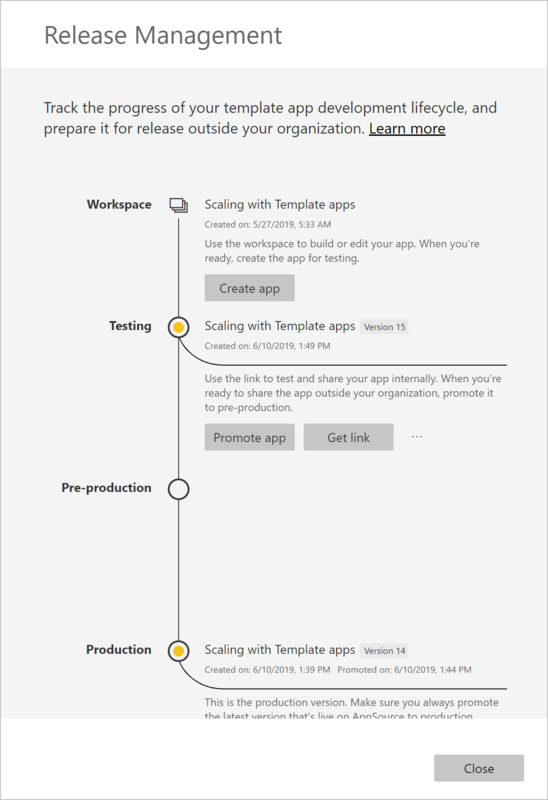 In the template app workspace, select Release Management. If you created the test app in Create the test template app above, the yellow dot next to Testing is already filled and you don't need to select Create app here. If you do select it, you go back into the template app creation process. To test the app installation experience, copy the link in the notification window and paste it in a new browser window. From here, you're following the same procedure your customers will follow. 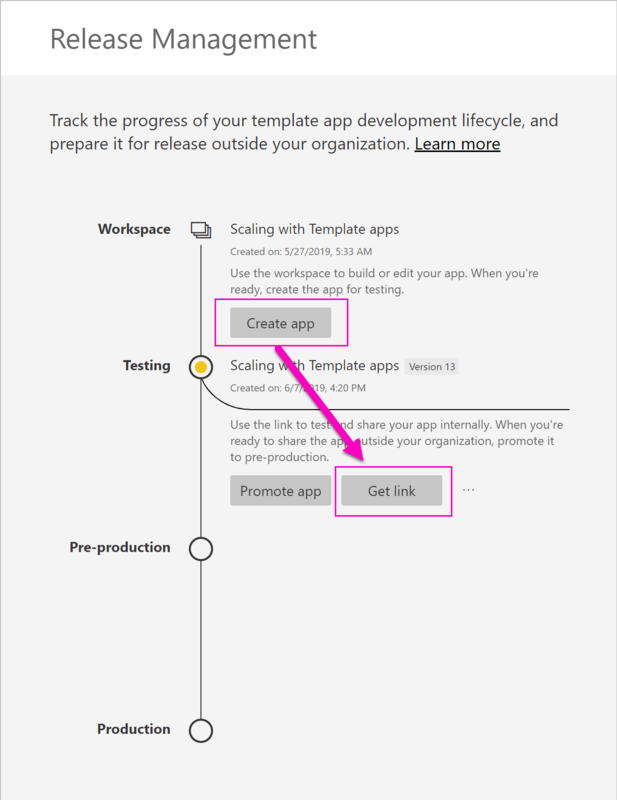 See Install and distribute template apps in your organization for their version. In the dialog box, select Install. When installation succeeds, you see a notification that the new app is ready. In Get started with your new app, you see your app as your customers will see it. Select Explore App to verify the test app with the sample data. To make any changes, go back to the app in the original workspace. Update the test app until you're satisfied. When you're ready to promote your app to pre-production for further testing outside your tenant, go back to the Release Management pane and select Promote app next to Testing. Select Promote to confirm your choice. Copy this new URL to share outside your tenant for testing. This link is also the one you submit to begin the process of distributing your app on AppSource by creating a new Cloud Partner Portal offer. Submit only pre-production links to the Cloud Partner Portal. Only after the app is approved and you get notification that it is published in AppSource, then you can promote this package to production in Power BI. When your app is ready for production or sharing via AppSource, go back to the Release Management pane and select Promote app next to Pre-production. Now your app is in production, and ready for distribution. To make your app widely available to thousands of Power BI users in the world, we encourage you to submit it to AppSource. See the Power BI Application offer for details. Now that your app is in production, you can start over in the test phase, without disrupting the app in production. In the Release management pane, select Create app. Go back through the app creation process. After you've set Branding, Content, Control, and Access, you again select Create app. Select Close and go back to Release management. You see you have two versions now: The version in production, plus a new version in testing. Your link is now live, submit it again to the Cloud Partner Portal by following the steps at Power BI App offer update. Promote your app to production stage only after your app is approved by Cloud Partner Portal and you published it. See how your customers interact with your template app in Install, customize, and distribute template apps in your organization. See the Power BI Application offer for details on distributing your app.